Last seen touring the country starring diva Craig Revel Horwood as the harridan Miss Hannigan, Nikolai Foster's jazzed-up rendition of the 1970's musical lands in London, starring TV personality and comedienne Miranda Hart. Billed to bow one stop away from the end, Hart is simply a cog in the very big wheel that makes this production a storming success. It's a refreshing antidote to see Annie in the West End; it's a musical packed full of optimism and sheer joy, which certainly is essential in the current climate. Will Annie find her true parents, or will she realise she's found a home in billionaire Oliver Warbucks? Yes, it's all very far-fetched (cue inspiring the President and his cabinet), but the message at the core is a simple one of hope. Charles Strouse and Martin Charnin's score shines bright here, with joyful songs including “Tomorrow”, “I Don't Need Anything But You” and the show-stopping “Easy Street”. Paired with Nick Winston's inspired choreography, particularly the ferociously fun “Hard Knock Life” and “Hooverville”, there's not a moment of rest, ensuring the production sweeps along nicely. Whilst there are no show-stealing performances, a strong ensemble is at the core of the cast. 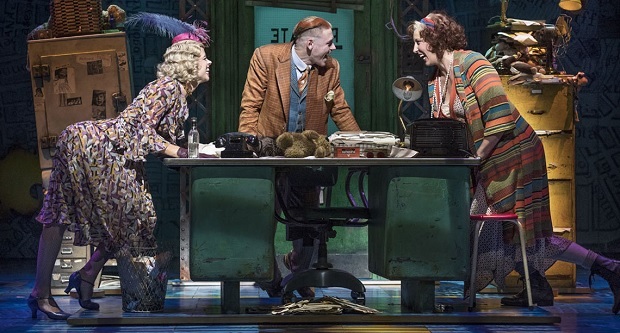 Miranda Hart is wonderfully surprising as Miss Hannigan, playing her with conviction, whilst Alex Bourne's Warbucks is played relatively straight and is very endearing. Madeleine Haynes' Annie is brilliantly punchy, full of vim and verve and surrounded by a troupe of talented orphans. But Jonny Fines and Holly Dale Spencer give the performances of the night in the Sinatra-voiced trickster Rooster and super sweet Grace Farrell. Pieced together in Colin Richmond's puzzle design, alongside fantastic costume choices, Annie glitters on the Piccadilly stage. And although Hart might be the selling point, the show is mightily worth seeing regardless. It shows the value of optimism, the value of a smile and the value of those around us. It may be a simple family musical, but it's got tons of heart.